Here at PURE, Independent Business Owners (IBOs) have seen incredible results from their participation in the Team28 Challenge. Cassie Wimberley is a PURE Silver IBO who saw amazing results with the 28-day Detox. After teaching in an elementary school, Cassie decided to stay home with her children and work her PURE business full time. She wanted her old self back and desired to feel comfortable again. Cassie participated in the 28-day detox program to develop healthier habits and to jumpstart her weight loss. She had been taking products by PURE for five months before starting the program, so she knew how wonderful they were. She invited her mother to join her and, together, they completed the program. 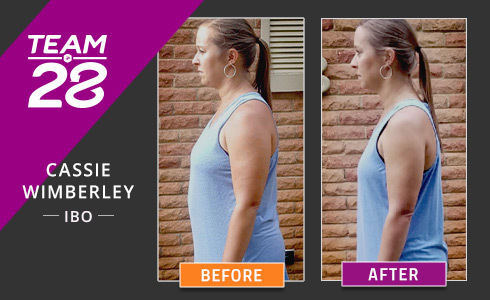 Cassie lost 15.4 pounds and 14.75 inches in 28 days. ** She has maintained the weight she lost and is enjoying wearing clothes she hasn’t worn in a long time. She found that the accompanying food guide and daily calendar were very helpful and motivating. When Cassie is not managing her PURE business, she enjoys making jewelry, painting, baking and spending time with her husband, her 9-year-old son and her 4-year-old daughter. Her favorite products are Organic Sulfur, CORE4 and PURE Café. She loves how the products are created for entire families. And she loves that every single ingredient in each product is listed on the label so you know exactly what you are taking. If you’d like to learn more about the PURE Detox and what it can do for you, visit https://livepure.com/7-day-detox.